Read This: Why doesn’t Rent hold up? Everything may be Rent (rent, rent, rent, ree-eent, rent), but that doesn’t mean Jonathan Larson’s groundbreaking musical has actually stood the test of time. In a new piece for Vox, former A.V. Clubber Caroline Framke examines why the musical feels so dated 20 years after its 1996 Broadway debut. 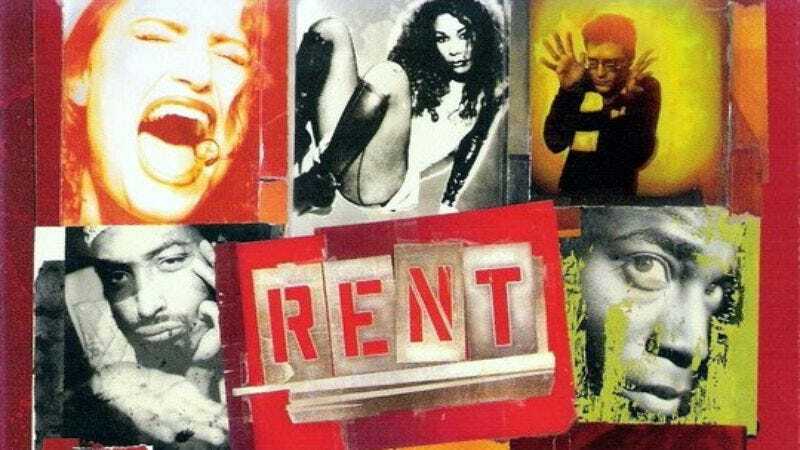 As Framke puts it, “[Rent’s] status as an important piece of art has devolved from musical wunderkind to frequent punchline.” She argues that Rent is just too explicitly tied to the ’90s—both in its musical style and its subject matter—to be timeless. Plus the show’s bohemian ideals (Roger and Mark are just mad that their friend/landlord won’t let them live rent-free) failed to remain relevant as the show’s “Rent-head” fans aged and realized that working for a living is, unfortunately, something everyone just has to do. Jonathan Larson intentionally wrote a musical that mostly sounded like what you could hear on pop music radio, as a means of making the story of La Boheme and his beloved, endangered East Village even more relevant to the era in which he was living… The only problem with relying on what’s popular at the moment you write it is that time doesn’t stop. If you want to move generations beyond the present, you have to tap into more than current trends as a means of communicating. Pop culture references fade—and if you depend on them too much, you risk losing your message, too. Of course, it should be noted that while it’s definitely a frequently mocked musical, Rent is still beloved by theater kids everywhere and regularly performed all over the country. In fact, a well-reviewed and sold-out Chicago production almost had to cancel its extension because the 2016 National Tour was also coming through (it all worked out in the end). All of which is to say that Hamilton fans worried their beloved musical will one day become irrelevant can rest easy knowing musical theater fans are nothing if not incredibly loyal.